If last week was the first week of Big Sky Conference contests that could be deemed “elimination games” appeared on the schedule, this is the week where the leaders of the pack can legitimately separate themselves form the rest of the league. 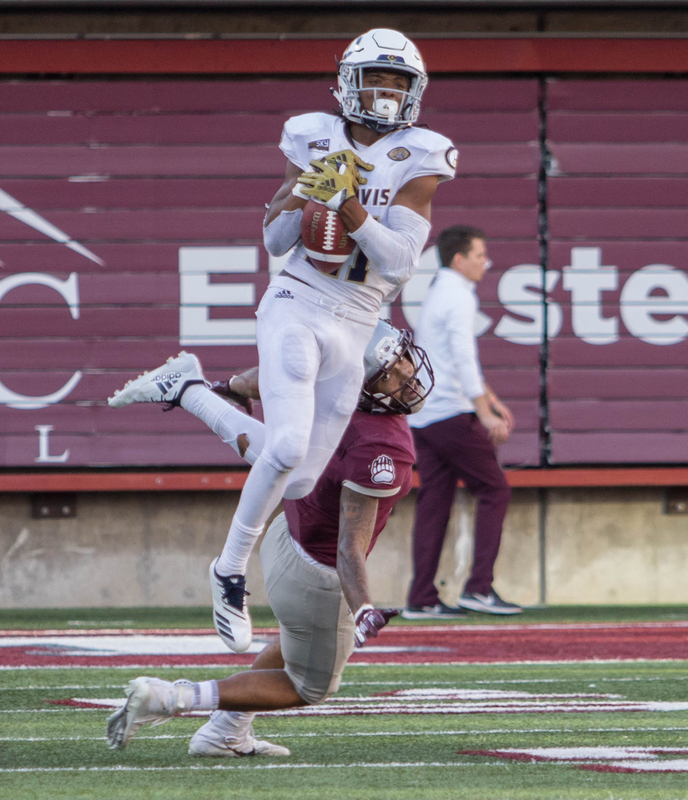 UC Davis scored 46 unanswered points, including 43 points in the final 18 minutes of the game in a 49-21 win at Montana to enter November with the only unbeaten mark in the Big Sky. At 7-1 and the lone loss coming at No. 9 Stanford, Davis is almost a shoe-in for its first ever berth in the FCS playoffs. Weber State won 35-30 at No. 22 North Dakota last week, Weber’s third win in a row to move to 6-2 and one step closer to the magical 7-win mark that helps solidify playoff resumes. That game also pushed UND to 5-3, meaning the Hawks’ first trip to Idaho since 2011 is a likely a must-win if the Fighting Hawks want to stay in the playoff picture. Eastern Washington entered its bye week two weeks ago off its first conference loss, a 14-6 defeat at the hands of Weber. 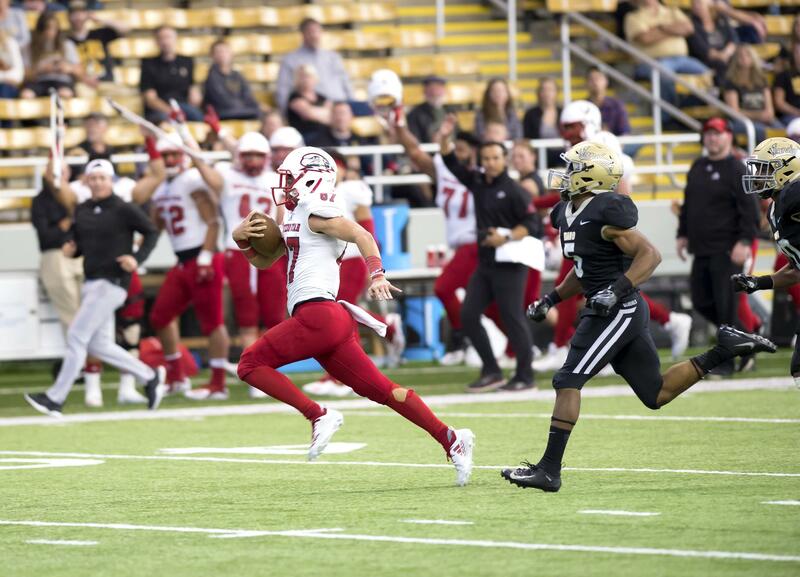 Coming out of the bye, EWU blasted Idaho 38-14 in the first meeting between the regional rivals since 1994. That victory keeps EWU on pace with the Wildcats with identical records of 4-1 in league, 6-2 overall. And Idaho State kept pace with the top portion of the league by moving to 4-1 in league play with a 24-17 win over Montana State. ISU will likely need to win out to make the playoffs because one of the Bengals’ five wins is against a Division II team. But if ISU does win out, they will be in the mix for the Big Sky title, particularly give the Bengals finish their season against Weber State and UC Davis plays at Eastern Washington next week. Davis, ISU and Weber’s wins all pushed Montana, Montana State and UND to the brink of elimination. Portland State has now won three straight after a 41-14 win at Sac State but with four losses entering November, the playoffs seem like a reach. The rest of the league already have five losses each, effectively eliminating them from the postseason picture. 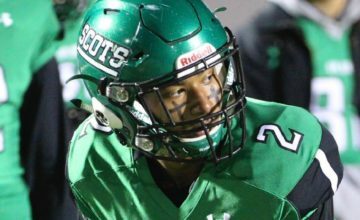 For the rest of the season, Skyline Sports will include North Dakota in its now 14-team weekly power rankings. The Fighting Hawks are going to continue having a profound influence on the league race and have an inside track to steal a playoff spot from a league striving to consistently get four bids. This week marks the sixth of eight editions of Skyline Sports’ Big Sky Conference power rankings. These rankings are based on strength of schedule, quality of wins and most recent performance. Included are our weekly picks from the previous and upcoming weeks. The top four in these rankings remain unchanged as the top four contenders stayed on the inside track to the postseason with wins to cap October. But each individual did contain something different for each contender. 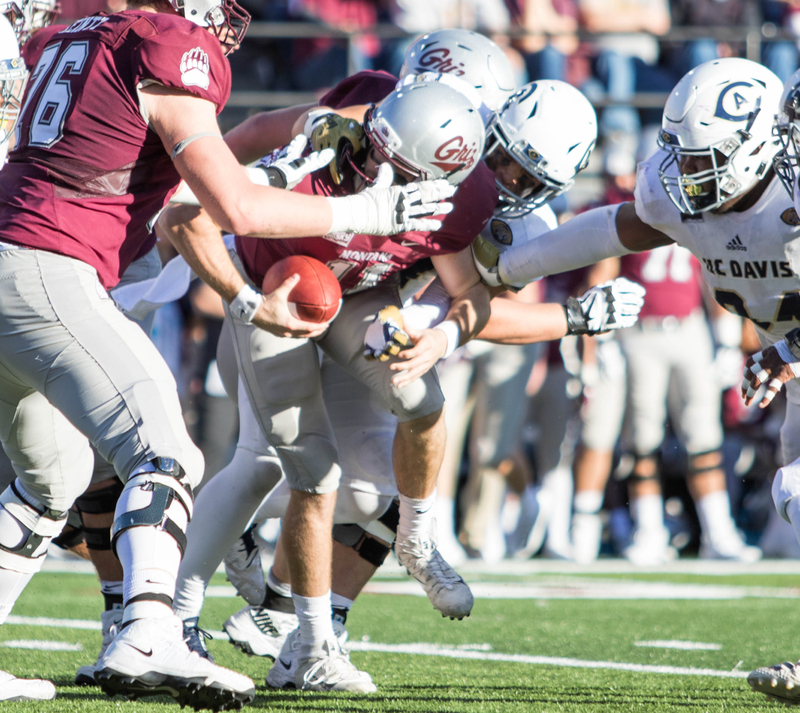 For Davis, the Aggies proved they could score in bunches and get into the high 40s for the seventh straight time against an FCS opponent despite a nightmare first half that included 11 penalties. And while Montana has struggled mightily over the last month, particularly when it comes to turning over the ball (12 turnovers the last three weeks total), a win in Missoula is historic for any Big Sky program. Montana has only lost 32 times in the 33-year history of Washington-Grizzly Stadium The win marked the largest margin of defeat for the Griz since Wash-Griz opened in 1986. Davis can guarantee itself its first ever playoff spot with a win at ailing NAU on Saturday. For Weber State, the Wildcat offense has seemed to catch a hot streak since the horrific injury suffered by redshirt freshman quarterback Kaden Jenks in the first half of WSU’s 34-24 win over Montana State. After that ankle dislocation, sophomore Jake Constantine returned to the game and completed 14-of-20 passes for 176 yards and led Weber on a 24-7 run to close out the Bobcats. Last week, Constantine threw for 318 yards and three touchdowns, earning Big Sky Offensive Player of the Week as the offense set season highs in passing yards and total yards (450). The Wildcats can keep pace and move one step closer to a third straight playoff berth with a win over struggling Sac State at home. 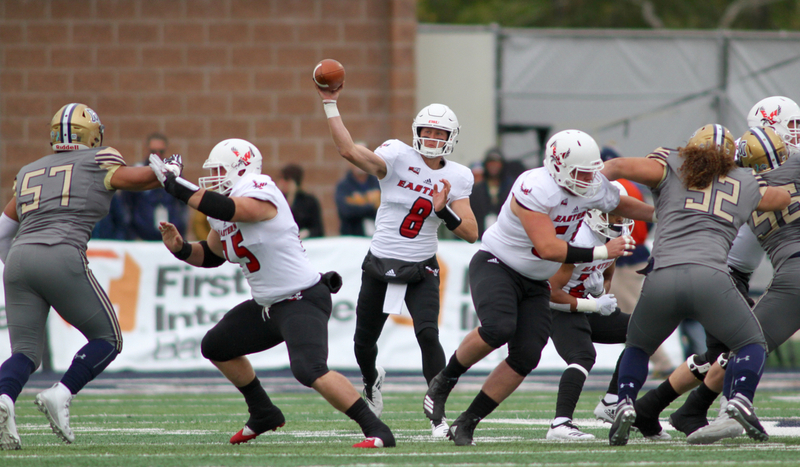 For Eastern Washington, Eric Barriere is no longer the quarterback of the future. The sophomore is the quarterback for the present AND the future with head coach Aaron Best’s announcement that All-American senior Gage Gubrud would have season ending surgery following the Idaho game. 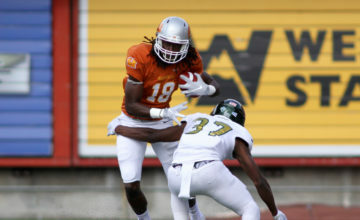 The fifth-year senior suffered the injury in EWU’s 34-17 win at Montana State on September 29. Gubrud finished his career as the owner of 21 school records, eight Big Sky Conference marks and three in the NCAA Football Championship Subdivision, most coming in a sensational sophomore campaign in 2016. With 11,026 yards of total offense in his career, Gubrud averaged 344.6 yards of total offense per game to rank third all-time in FCS and break the Big Sky record of 328.9 set by Dave Dickenson of Montana with 11,513 yards in 35 games from 1992-95. Gubrud went over the 10,000-yard mark in his career for total offense on Sept. 8 at Northern Arizona to become the fourth Eagle in school history to achieve that feat. He finished just 16 yards from joining those same three players in the 10,000-yard passing club, with a current total of 9,984 in his career. His average of 312.0 per game was a school record, and ranks third in Big Sky history and 20th in FCS. Now the job of taking over as the starter for the quarterback factory of the Big Sky falls to Barriere, a 6-foot sophomore with some of the best wheels for a gunslinger in the league. He’s started the last three games, posting a 2-1 record, the lone loss to Weber and the Wildcats’ star-studded defense. Barriere is completing 57.8 percent of his passes and is throwing for 248 yards a game in his three starts. Last week against Idaho, he threw for 326 yards and three touchdowns. He is also averaging 6.4 yards per rush and has rushed for 230 yards and three touchdowns total in his three starts. And for Idaho State, several things are new, both concerning the scope of this season and the historical context of some unusual success in Pocatello. Last week, Idaho State’s offense struggled to find a flow or rhythm as MSU possessed the ball in giant chunks and the Bobcat defense largely stuffed ISU’s powerful run game. The Bengals turned the ball over twice in the fourth quarter as the Bobcats cut a 24-7 lead to 24-17 late in the fourth quarter. But Idaho State closed out the gritty win to stay alive in the playoff hunt entering the final month of the season. ISU has not been in the playoff race period since 2014. That season, the Bengals lost what amounted to a playoff game in Bozeman to a Montana State team that finished with an identical 8-4 record. Idaho State has not made the playoffs since 1983. ISU will likely need three more wins in three games to change that, starting with Portland State, one of the hottest teams in the league. These rankings account for recent play more than any other factor. UND’s defense looked suddenly vulnerable last week at home against a Weber State team that has won almost exclusively with a defensive style and explosive contributions from their special teams. North Dakota’s defense has been vulnerable against the pass all season, giving up 263 yards per game through the air per outing. Constantine, a quarterback who largely struggled until Jenks’ injury, diced up the aggressive yet vulnerable Fighting Hawks’ defense, pushing North Dakota to the brink if the team wants to earn an at-large bid during this season playing as an FCS independent. Portland State’s three-game winning streak comes with a caveat — most spurts in the 14-team Big Sky do because of the unbalanced scheduling and variety the giant league presents — but the Vikings have a current win streak matched by only Weber State and surpassed by only UC Davis. PSU’s 22-20 win thanks to a 53-yard field goal with four seconds left over Montana in Missoula led to a 35-0 halftime lead in a 35-14 win over Northern Colorado. Coming out of a mid-October bye, PSU kept rolling, bursting to a 34-7 lead in the 41-14 win over Sac State. If the Vikings can beat Idaho State this weekend, all of a sudden the playoffs might be on the table again. PSU ends the season at North Dakota before hosting Eastern Washington in the Battle for the Dam Cup to end the season. Three straight wins over three playoff hopefuls would push the Vikings to 7-4 and squarely on the playoff bubble. Same premise: Cal Poly and Northern Colorado do not have better bodies of work than the Bobcats or the Grizzlies per se. But Montana State head coach Jeff Choate acknowledged Cal Poly seems to be peaking, having won two of three games entering Saturday’s matchup with the Bobcats in Bozeman. MSU has lost two straight, albeit to stouter opponents than the bottom-feeding Sac State team the Mustangs ran over or the ailing Northern Arizona team Cal Poly ran through. Montana has better talent and has played at a higher level during stretches than any of the other four teams here have reached this season. But Montana’s problem is the Griz have rarely played a complete game, have been plagued by turnovers and will have to buck the pressure of a historic losing streak to get back on track. Northern Colorado first showed life after scoring 26 points in the final eight minutes of a 49-36 loss to UC Davis in which the Bears trailed 49-10. UNC hit rock bottom with a 35-14 loss to Portland State. A group of key veterans earned suspensions by not showing up for team curfew that night. The next week, with 12 players out, UNC ripped Northern Arizona 49-14. Last week, the Bears built a 42-18 lead before hanging on for a 42-39 win over Southern Utah. Again, UNC’s wins are against teams near the bottom of these rankings, as are Cal Poly’s victories. But they are wins nonetheless. Victories have been all but non existent over the last month in the Treasure State. Montana went 0-3 in October while Montana State went 1-2, the lone win by one point, 24-23 over Idaho. The ‘Cats and the Griz can bump back into the top half of these rankings with wins this weekend. MSU hosts Cal Poly while UM plays at Southern Utah. Northern Colorado’s streak will likely halt with EWU coming to town. Idaho hosts North Dakota for the first time since 2011. The Vandals host Montana, the fourth rivalry game in UI’s return to the Big Sky this season. Idaho lost to regional rivals Idaho State (62-28), Montana State (24-23) and Eastern Washington (38-14). A win over the Fighting Hawks, the Griz or both could help salvage an otherwise disappointing return to the Big Sky. And it could be the final bright spot in a season that ends with a dismal challenge. Idaho’s season finale comes at No. 13 Florida in Gainesville on November 17. The Gators have been ranked as No. 9 in the FBS national polls. Quarterback injuries have been a rash across the league. From EWU’s Gubrud to Sac State’s Thomson to Montana State’s Troy Andersen to Northern Colorado’s Jacob Knipp, starters across the league have missed time. But NAU and SUU seem to be in a competition to see who’s quarterback ranks can become more decimated by season’s end. NAU’s loss of All-American Case Cookus served as one of the impactful injuries in the Big Sky this season. Daniel Bridge-Gadd, a former Arizona Gatorade Player of the Year who spent two seasons at Washington, struggled with the run-pass option fake portion of Northern Arizona’s offense, fumbling the ball nine times in his first three starts before suffering a knee injury against Northern Colorado. True freshman Gino Campiotti struggled in his first start, throwing three interceptions at UNC. NAU 21st-year head coach Jerome Souers replaced Campiotti with wide receiver Brandon Porter at halftime. The 5-foot-10 high school quarterback and Northern Arizona redshirt freshman completed 2-of-8 passes, including a 20-yard touchdown to former All-American Emmanuel Butler. He also rushed 11 times for 115 yards as NAU piled up 356 yards rushing but lost 38-28 to Cal Poly, the fifth loss in seven outings since Cookus’ injury. Southern Utah hasn’t reached the point of playing a redshirt freshman wide receiver at quarterback. But the situation has been almost as perplexing for the Thunderbirds. Junior college transfer Chris Helbig threw for more than 300 yards in SUU’s first two games and at least 270 in his first three starts, although SUU lost all three of those games, the second two at Oregon State and at Arizona. Helbig suffered a season-ending injury in SUU’s Big Sky opener, a 31-23 loss to NAU. Aaron Zhalen, the former four-star recruit who walked on at SUU after parting ways with Hawaii, started in a loss to Eastern Washington and a win over Sac State. He suffered an injury early in SUU’s game at Idaho, giving way to true freshman Austin Ewing. The rookie from Hawaii has operated almost exclusively as a Wildcat quarterback. He totaled 201 yards against the Vandals. Ewing suffered an injury early on against Northern Colorado, helping UNC built a 42-18 lead. Tyler Skidmore, a freshman who graduated high school in 2014 before going on an LDS Mission, earned his first snaps. He threw for 330 yards, including a 74-yard touchdown to Landen Measom. The walk-on completed 27-of-44 passes on SUU’s seventh loss in eight games. Skidmore is expected to start against Montana this week in Cedar City, Utah. Elijah Dotson continues his superb sophomore season for Sac. That’s about the only bright spot for a team that is riddled by injuries and can’t seem to find its footing. Dotson joined Protheroe as the only backs so far this season to surpass 1,000 yards this season. Dotson is averaging 6.9 yards per carry and has 1,058 yards thsi season. He has scored nine touchdowns and is averaging 132.2 yards per game, the second-highest total in the league. 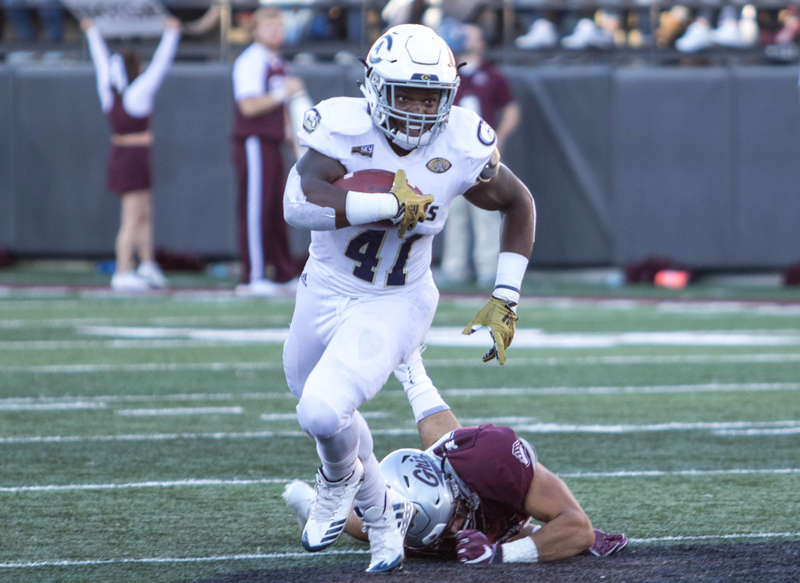 But Sac has not been able to manufacture any scoring other than Dotson’s explosive runs since senior quarterback Kevin Thomson went down in the first quarter at Southern Utah. Since that injury, the team has scored 49 points over the last 11 quarters, including a season-low 14 points last week in the loss to Portland State. For a tea that won six league game last season, the next chance for a breakthrough is not an easy one. The Hornets play at Weber State. Photos by Brooks Nuanez or noted. All Rights Reserved. 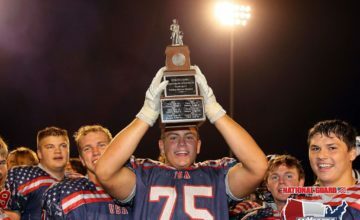 Colter Nuanez is the co-founder and senior writer for Skyline Sports. After spending six years in the newspaper industry with stops at the Missoulian, the Ellensburg Daily Record and the Bozeman Daily Chronicle, the former Washington Newspaper Association Sportswriter of the Year and University of Montana Journalism School graduate ('09) has cultivated a deep passion for sports journalism during his 13-year career covering the Big Sky Conference. In August of 2014, Colter and brother Brooks merged their passions of writing and art to found Skyline Sports. 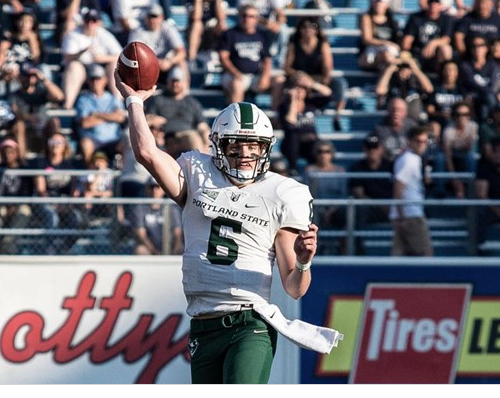 Skyline Sports is an independent newsgathering website covering the Big Sky Conference with more depth, breadth and passion than anyone in the West.